Tigers & Strawberries » Is Alice Waters an Elitist Food Snob? Is Alice Waters an Elitist Food Snob? I had no idea so many people hated Alice Waters. I mean, I thought Hilary Clinton was the American woman everyone all along the political spectrum loved to hate, but after reading the comments on Salon’s recent interview with Waters entitled, “Go Ask Alice,” I may have to revise my viewpoint on that matter. Maybe Hilary is now the second most hated woman in American, right behind Alice. Good lord, some of the posters over there sound as shrill as Ann Coulter braying about the horrific evils of democrats, progressives and liberals. You know, folks like Alice Waters. She doesn’t say that, ever. She doesn’t believe that good food should be expensive, and in many cases, it isn’t that expensive. She believes that everyone should have access to good food, rich, poor and in between. Besides, I find it ironic in the extreme that it is now considered elitist for people to eat like I did when I was growing up as a lower-middle class Appalachian farm kid. Sure we ate well, (even when we were poor because Dad was laid off for more than a year–the farm food saved us that year) but we saved money while doing so, and we did so out of a sense of frugality, as much as because of taste and nutritive value. So, I cannot help but laugh when I hear or read folks going on about how it is elitist to eat farm-fresh food. In fact, this irony is a symptom of just how messed up our current food system is in the US. It is just whacked. Not even two generations ago, it was quite different, and in many cases, better. Heck, even I can remember grocery store chicken tasting better than it does now, and I am only 42. Yeah, so here I am, saying that if Salon readers think that Alice Waters is an elitist, either they are not aware of the definition of that word, or they are just feeling defensive about their own food choices. And that is okay–one problem with Waters is that she is an idealist–an uncompromising idealist at that–and folks who not only espouse idealistic philosophy, but also -live- by it, make everyone feel inadequate and defensive when they compare themselves to the idealist. Frankly, I think that the uncompromising idealism that Waters espouses is probably detrimental to her overall message. Folks tend to stop listening when they get the idea that an idealist is saying something which runs counter to the listener’s experience, and often seems to invalidate that experience. This is not conducive to good communication. And that really doesn’t help get Waters’ message across to the folks who most need to hear it, which includes middle-class liberals and progressives–you know, like the folks who read Salon. Besides, when idealists will not compromise on principles, it makes others think that what the idealist wants them to do is just too hard. It becomes an all or nothing proposition. Either you eat all local, fresh food, or you are a failure, and evil person, is what people hear, even though it is not what Waters has ever said. A glance at a few generalizations gleaned from the comments section at the Salon article, may illustrate what I mean. Readers said that Waters can eat locally all the time because she is in Northern California where there is a mild climate so there is always fresh food. They said they cannot afford to pay five dollars for a bunch of radishes. They said that they refuse to eat only sauerkraut and sausages or turnips and beets all winter long, because “that is all that is in season.” They said only the rich can eat that way, and the rich are the only folks Waters cares about. They said that there are no farmers’ markets near their homes, so Waters should use her celebrity to go to the government and make those markets appear instead of bugging them about changing their own lives and food habits. Let’s examine those statements. First of all, yes, Waters lives in California, and yes, there is a veritable plethora of amazing produce grown there, year round in the very mild, even climate there. That is all quite true. What is also quite true, is that there are lots of places in the country where a large amount of crops can be grown nearly year round, too. As proof, I suggest everyone take a look at the photograph above. It represents a mere fraction of the fruits, vegetables, herbs and fungi available at the Athens, Ohio, Farmer’s Market in late October. I didn’t include any of the preserves, cheese, meats, eggs or other animal products, nor the ciders, nor many other varieties of fruits and vegetables. It is just a representative sample of what I picked up this past Saturday, on an average October day. 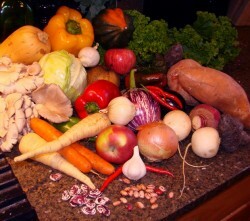 Three kinds of potatoes, sweet potatoes, two types of turnips, cabbage, mustard greens, collards and kale, sweet and hot peppers, apples, Asian pears, pears, dried horticultural beans and dried Christmas limas, carrots, parsnips, radishes, cilantro, basil, oyster mushrooms, and two kinds of winter squash. Oh, and while I am at it–none of these radishes cost five dollars a bunch. The Athens Ohio Farmers’ Market has produce quite reasonably priced, because we are in the poorest county in Ohio. Yes, people, Athens, Ohio, is a small town in the middle of dirt-poor white trash Appalachia, yet, we have local food year round here, and because folks here are poor–not only are the prices good, many farmers accept WIC coupons, food stamps and food vouchers given to the elderly. Does that make us all elitists like Alice Waters? If that is so, then every kid who grew up on a farm in Appalachia, eating fresh food, is an elitist, too. And the idea of us hillbilly farm kids as food snobs just cannot help but make me laugh until I am about to wet my pants. It is just too funny. Now, that is not to say that there aren’t places where it is hard to eat locally all the time, but does anyone really think Alice Waters is going to hate them forever if they eat frozen vegetables in the winter months? No. She isn’t going to hate them, and neither am I, but the fact remains that in the summer time, in most parts of the US, there is a growing number of farmers making a surprising amount of local produce available to the public, at prices much less than five dollars for a bunch of radishes. Look folks, just because Alice Waters is uncompromising in her personal life doesn’t mean she will despise you and look down on you if you make compromises and only eat partially locally. She will just be happy you are making an effort, as will I and your family and your taste buds and your stomach. Long before Jamie Oliver had the idea to improve school lunches in the UK, Waters’ Chez Panisse Foundation started an initiative called “The Edible Schoolyard Project.” This program, meant to be a pilot prototype for other, similar projects around the country, involves a one acre garden plot on the grounds of a public middle school in Berkley, where kids grow the food as part of class, then learn to harvest, cook and eat it. This program was put specifically in place in a public school district where kids of many income levels and ethnic backgrounds all learn together. Tell me, if Waters was really an elitist who only cared about rich people and lining her own pockets and food snobs, wouldn’t she have started her project in a private school which only accepts rich kids as students? She has continued her work with The School Lunch Initiative, which is a program which has successfully removed 95 percent of the junk food from her school district’s lunch programs. That is nothing to sneeze at. Again, if all she cared about was rich folks, she wouldn’t be doing so much work on behalf of lower, middle and upper middle class school kids. She has done all this because she is a celebrity chef, but other programs copying her success have sprung up around the country, including here in Athens, Ohio, which are NOT started and run by celebrities. The local food scene here in Athens is as big as it is because committed citizens made it so. Consumers wanted good food, farmers and food producers wanted to make a decent living, so people went to work to make it happen. And it has happened and it is still happening. And we have no Alice Waters here, making it happen–just concerned citizens willing to do the work. I think that is what stung some people. Seeing someone who is such an uncompromising idealist working hard to make things happen tends to sting some folks’ consciences, and it makes them feel a tad bit cranky and so they lash out. Instead of using that crankiness to go forth and do something good in the world to improve their own situations, and the situations of those around them, they instead complain, and lash out against the idealist who is pointing out the path to them. That said, I do want to point out a little Alice Waters faux pas. Just so you know I am not one of those folks who worship her toe jam and think she can do no wrong. No–she is human, just like the rest of us and buggers things up every now and then like everyone else. Recently, it seems, she has buggered up big time and may have done something which will only fuel the “Alice Waters is an elitist food snob” fire like gasoline poured onto a charcoal grill. Over at The Ethicurian, a terrific food blog, there is a post written by novelist Charlotte McGuinn Freeman where she asks the legitimate question, “Why is Alice Waters involved in the building of a gated community in Montana?” The developer promised to use green building and conservation techniques, but this appears to have turned out to be a case of greenwashing. There is supposed to be a staff farmer growing food on the site, but the locals are concerned about the fact that the proposed McMansions are going to use way more water resources than the arid climate can sustain. How is Waters involved? Apparently, the holiday edition of the Neiman-Marcus Catalog includes the offer that if anyone purchases a ten acre building site in the Ameya Preserve, Alice Waters will come and cook dinner for them and their friends. Oh, and supposedly, she gets to open her own culinary school in the gated community. It all sounds pretty shady to me, and has led to quite a few of Waters usual supporters (including myself) to ask a few questions, and notice that our culinary idol may well have feet of clay. For those who are wondering why Waters may have gotten involved in what sounds suspiciously like an elitist land development project, I think we have seen the answer. They offered a generous donation to her new pet cause, Slow Food Nation, and offered her land on which to build her culinary institute. They probably highly touted the sustainability of the project, and I suspect that Waters trustingly accepted, the temptation of the donation for her pet project being too sweet to turn down. So, knowing all of this, is Alice Waters just another elitist celebrity chef? Has she done more harm than good? Is she the worst thing since sliced bread? Or, is she a saint of all that is edible, the Goddess of America’s Kitchen, the bringer of all that is holy, local and sustainable? Or, is she just human, like the rest of us, trying to do good, but every now and then, screwing something up? If you cannot guess it, I vote that she is only human: mostly good, some bad, doing her best, and often, doing a great deal of good in the process of living her life. I like Waters; she is one of my favorite chefs in the country. I think that she has done a lot to help revolutionize American food and cookery; as much as Julia Child has done certainly. Though, I think that Waters has had more of an effect on other chefs than on ordinary home cooks, which is where Child really had a great deal of influence. I also had one of my favorite restaurant meals in my life at Chez Panisse back in about 1995 or so. It was a fantastic experience–one of my best restaurant experiences ever, and I have to say, it was life-changing for Zak as well. He discovered at that meal that not only did he like fresh green lima beans, he really liked good olives. In fact, he discovered that the only reason he hated olives was that he had only eaten bad ones during his childhood, and so knew no better. Now, he eats good olives with great glee and gusto. No one in her restaurant staff acted like snobs to us–in fact, they were down-to-earth, and the entire atmosphere was very earthy and friendly. They were gracious and graceful in their service. I just cannot believe that if their employer was an elitist, that they themselves could possibly be so open, accommodating, and delightful, not only as staff–but as people. I know that this will sound insufferably Californian, but these folks had a great vibe to them, and the restaurant was filled with good energy. I think that if Waters was as uncaring and awful as the opinions flying thick and fast at Salon would indicate, that Chez Panisse would not be as amazing an experience as it was. So, I do like Alice Waters, and I cannot really believe that she is truly an elitist food snob. That said–I do think that she may have some serious explaining to do about her involvement with the Ameya Preserve development. Thank you, Barbara, for giving me the right label for Alice Waters: idealist. That is just right. I think people get the idea that she is elitist because she doesn’t spend enough time disclaimer-ing about how it’s really hard for the urban poor to eat her way. And it is hard, but it fits with her being an idealist that what she does best is express her vision and how much she hopes to share her vision with everyone, rather than spending a lot of time talking disclaimers and talking about the social dynamics. Someone does need to do that, but it is being done by others. And as you say she works to bring down that barrier in various ways, so she is aware and endeavoring. Futhermore, virtually everyone who reads Salon is in the target group for whom this is really not as hard as they make it sound — they just haven’t committed to doing it yet. I read the article on Salon the other day and thought about it a lot, and how I still haven’t quite gotten into that mindset totally even though I agree with the philosophy. I thought about it just now while I was shelling cranberry beans, where she talks about how washing lettuce is meditative for her. I was feeling the same way about cranberry beans — and in a moment of sublime combination, I had the thought thanks to you tipping us all off about cranberry beans ages ago, and grabbing them up at the farmer’s market ever since, and then I come here and you’ve written about the article and it’s just a very pleasant synchronicity. Also, the quality of discourse on Salon has really gone down in the last few years. I canceled my subscription with them and find that I rarely read an article that is really good there, though I still like a few of their blogs and columns. 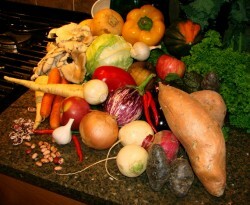 One of the main concerns I have with the slow (food) movement – which is just that, a concern, not ZOMGITISEVIL – is something that I’ve found gets minimal play in the discussion, which is the way slow food movements and similar movements do have significantly predominant effects on women, given the continuing issues of division of labor in the home. Which I think isn’t an issue with the concept of slow food, but an issue of how it’s implemented and how it’s often discussed. My partner and I do what we can, and we generally share the cooking relatively well (I say relatively because we both like to cook, so it’s rather like children who share their toys relatively well), but, sadly, even in the liberal/progressive spheres far too many households don’t work that way. For some more commentary on the ‘slow’ movement and how it interacts with assumptions about unpaid female labour, there’s some good stuff here and (more specifically related to food consumption) here. At the same time, I do think significant areas of the slow movements do fail to acknowledge the extra challenges involved for poorer folk (though perhaps in regard to slow food and farmer’s markets it’s ‘poorer in densely populated urban environments folk’), and those who are time-poor as a function of their lower incomes (I’m thinking working parents with mutliple jobs and suchlike, here), often because it hasn’t occurred to them. But I’m not going to place all the blame on Alice Waters, because that’s ultimately rather stupid. I suspect there’s some unexamined privilege in certain respects, but, well, that description applies to far too many folk to count, including, I suspect, most of the folk ragging on her at Salon. I like the idea of local food, especially since I live in a farmy state (Indiana)… until I have to get up early on a Saturday to get to a farm market. I get up at 5 AM five days a week, so getting up early on one of my days off doesn’t go over real well! To solve this ethical dilemma, I’m most likely joining a CSA this year. “tin-plated…” Trouble with Tribbles? I kinda cheated though – I recognized it, but the hubby came up with the title. The problem that I have with Alice Waters is not that I think she’s elitist, it’s that it seems as though everything she says is infused with a mild air of eau de sanctimony. (She also reminds me of those people who drive you up a wall because they’re so beatific.) It’s not something I could easily explain, but reading the NYT piece and the Salon article, I wanted to scream. It’s not a question of her message, it’s just something about her that just rubs me the wrong way. I can’t say whether or not the Salon commenters feel similarly (I suspect not, because I like Waters’ message), but I think there are as many problems with the tone as with the message itself. I have a feeling some of the bad attitude towards Alice Waters is not really aimed at her, but is instead mis-directed anger and frustration at the food production and distribution in the U.S. You can not readily get the food that is grown in your neighborhood, but you can get the same items if they’ve been shipped in from all over the country (and world). How . . . illogical. “Delusions of godhood” – C3P0 in Return of the Jedi? I don’t have an opinion about Alice Waters, but I wanted to mention that I buy local organic chickens and beef at less than grocery store prices because I buy them locally. Sadly, I must also mention that I had to tell my 31-yr-old lab assistant how to cook chicken from raw (‘from scratch’ doesn’t seem to even apply) about 2 weeks ago. It’s a trend I applaud however sanctimonious the preachers are. The fact that slow food is, well, slow, is a problem for small households as well as for women in unequal-labor households. I’ve actually been devoting a lot of thought to this lately because as a single person, cooking for myself is somewhat labor intensive. I get leftovers in the bargain, but it’s still intensive. For example, I’d love to make my own snack bars and bread, to reduce waste and save money, but it’s a lot of time. (I already make my own granola, hummus, and a lot of other stuff that many people buy ready-made.) I could end up doing very little besides working and cooking, and as lovely as slow food is, and as much as I love cooking, that isn’t really how I want to spend my life. I have other interests and priorities too. But creating a food co-op or doing a dinner/snack rotation isn’t that easy either; you have to get a bunch of like-minded people together, which at least where I live also often means geographically scattered. I haven’t really come up with a solution for myself yet, though I haven’t given up. So basically the time problem is a little like the other things — she’s idealist about it, so she states (accurately, I think) that most people who complain about the time issue just don’t appreciate the value of the slow food. This frustrates people like me and I suspect many T&S readers who do appreciate, but find that there are practical limits, and we end up feeling kind of dissed by Alice Waters, lumped in with those who don’t ‘get it’. That’s why I think the idealist label is so helpful — it makes me realize that while I can personally be frustrated by the time issue, she isn’t trying to dis anyone, she just has a vision that she wants to make attractive and accessible, and so she wants to make the barriers look small, maybe sometimes (nobly but nevertheless somewhat annoyingly) smaller than they are. I wrote a big long comment, but it was grouchy. Anyway: yes, I think our food supply is messed up. Currently, I don’t think her concept of “affordable” is accessible to everyone, particularly the urban poor, particularly the urban poor working multiple jobs in cold climates. Her concept of available midwinter produce in the midwest is odd, as well–sure, if I buy stuff shipped in from California. She IS an idealist, and an idealist who seems to prefer telling people for whom organic local food is not affordable, who cannot “slow down” without losing their homes, that “they should just try harder” instead of thinking about ways to change the system. The impression I get from her article is that the only reason someone wouldn’t eat like she suggests is lack of willpower and poor priorities, which is pretty classist and shows a complete lack of understanding of the position of the urban poor in particular, who don’t have access to cheap farm food, who are often dependent on slow and unreliable public transportation, and for whom canned vegetables will always, always be cheaper than fresh of any kind, leaving pennies to do things like buy their kids shoes. Should things be like this? No. But they are, and judging the victims instead of trying to change the system sits badly with me. Everybody on this planet is going to have to do greenhousing because of global warming. …does she understand anything about global warming? Some climates will become greenhouse-like; others will desertify and water is going to much more of an issue than anything else. Where is the water going to come from? Also, RIGHT NOW, not everywhere uses greenhouses, so greenhouse produce isn’t available to everyone in cold climates (they are agriculturally uncommon in Colorado, which has an approximately 6-month farmer’s market season, although a year-round ranching season). I know one of the reasons I always get frustrated is that I live in the Canadian foothills, and there just isn’t local food the same way – even most of the stuff from the farmer’s markets has to be shipped from 3-8 hour drive away, because growing conditions out here just aren’t very good. (Just look at my poor garden, who I was very good to this year, and the beets that after a whole season of water and care grew to be the size of two joints on my pinkie finger.) The only fruit that grows here are berries (and I must add, because I’m proud, that the berry orchard that we’re turning the front lawn in to is coming along nicely!). I get frustrated in part because I’m jealous. However, I also grew up in a house where we ate together every single day, and generally from scratch. (Though there was the occasional box of Rice’r’roni, but I think that’s got to be okay occasionally.) So from that side she’s preaching to the choir. I think it’s hard because her idealism often seems very rigid, and that gets peoples backs’ up – I get that from some of what she says too. You know, “why is it not enough that I cook most of my food from scratch, from my own garden or locally when I can? Some times I want fruit! Or Chinese dumplings! And you make me feel bad for wanting it!” And feeling bad/guilty makes people hostile. Your post was so insightful – it really made me think about why I react to her in such a mixed way. I do think it’s her style that puts people off. She is an idealist and aspirational, and that makes people uncomfortable. But really – I get really ticked off when I hear people say that cooking from scratch or buying fresh ingredients is some kind of elitist indulgence. 99% of the world cooks and eats this way, including some very poor communities both here and abroad. I have lost track of the converations I have had in which I try (unsuccessfully) to convince people that eating fresh food cooked from scratch is actually cheaper than buying convenience food. Yes, cheaper. Not only better, but cheaper. And yes, that means you have to cook, but what’s wrong with that? I work 60-80 hour weeks and still cook from scratch every night. And I’m not a superwoman. It just takes a bit of knowledge and some organizational skills (prep things the night before, but beans on to soak that morning, fire up the grill while you are cleaning out the car, etc…). Only in the US is it seen as suspicious and vaugely undemocratic to want to eat simply and well. Fast food is crap, but it’s available to everyone. Home-made food takes some skills. Basic skills it is true, but come on – it’s not rocket science. I’m sure Waters has some of the same problems, just in reverse. After all, I’m doing the same thing. After 2 years in California, I’ve moved to Wisconsin. I know roughly when things ought to be in season, and *what* things ought to grow here… and I still have shocks. The climate is a nice climate for stone fruit, but hardly any is grown locally. On the other hand, lettuces are abundant. When you don’t have first hand knowledge, you can end up looking really dumb about local food. Waters is not immune. i was one of those who wondered how expensive and practical it was to eat organic and local. i discovered that it’s not that hard, really. plus, we grew most of our veggies this summer in our yard, and have some left over for the winter. you don’t even need a large plot of land to grow soemthing locally and organically. a couple of pots and some dedication is all you need. as for those railing against alice waters, have they event tried eating locally? have they tried finding out which vendors carry local produce? which restaurants promote local farmers? i suspect they are just too lazy. i mean, we still buy bananas and a lot of other things, but people do have a choice about the businesses they support. it’s not that difficult, and it doesn’t mean spending 50 dollars at an elite store for two meals’ worth of produce. Ah, yes, the “what do you do in winter” question. As a resident of one of the parts of the US where winter produce is pretty limited (our last farmers market is this Saturday, and I plan to stock up, but I don’t have the resources nor the storage to buy enough of the local stuff to last through to when there’s vegetables again), I’ve come to terms with buying the veggies that have been shipped around the world. I like living in the frozen north too much to exchange it for a region with year-round farming. So in Nov – May (and often somewhat later), we buy veggies from the supermarket. And of course we buy citrus and avocados and other things that just will not grow in this climate. Buying local 6 months a year is still a whole lot better than not doing so ever. Elitism doesn’t have to be the overt “screw the poor” dismissal that you suggest; it can be the thoughtless “everyone should do X” without thinking of the class-related difficulties that may make X more difficult for some than others, as well. And while you convincingly argue that it’s easy for the rural poor to eat well and locally, I’d suggest that in most cases it *isn’t* so easy for the urban poor to do so, considering that in many cases there isn’t even a *supermarket* in poor urban neighborhoods, let alone a farmers’ market or other forms of access to good local produce, just convenience stores. There are people making good efforts to change this, with things like community gardens, but they still aren’t ubiquitious. I’d imagine that the very poorest counties in the US (Indian reservations, mostly) do a lot of eating locally because they’re doing lots of subsistence farming, but the poorest city areas? Not likely. I, too, have been quite surprised at all the Alice Waters hating I’ve heard in the past few weeks. My feeling is that she is one of the people who revolutionized the way people in this country eat and think about food. Whether or not her ideas are perfectly practical and apply on Tuesday night when I’m hungry enough to order a burrito, doesn’t really matter to me. They’re lovely ideas all the same, and I’m glad there out there, and that I’ve been influenced by them. A lot of people hate Al Gore and Pope Benedict, too. It’s difficult to deal with people so single-minded and unwavering. So we just make them wrong. As others have mentioned, I think it’s difficult to extrapolate from poor people who live on farms to poor people who don’t live on farms, in terms of availability of fresh food. It’s also not always accurate to extrapolate from late October to mid-winter – where I live, we have plenty of local veggies available in October, but then in November and December a lot of the farmer’s markets close up, and at the ones that stay open year-round we’re left with pumpkin, onions, potatoes, and apples all winter. Fortunately, I like pumpkin, onions, potatoes, and apples. I think I’d also have to question her romanticization of local farming. To some degree, it also sounds like she thinks that subsistence farming is somehow just peachy because it puts people in touch with locally grown food that they’ve worked to produce. That is a phenomenally privileged idea of what actual subsistence farming is like, where one is at the whim of weather, soil conditions, and political upheaval (particularly in the third world). It can also be back breaking work. For those of us who come from privilege the fact that it was a lousy summer for tomatoes means we can still go to the grocery store. That’s not that case with genuine subsistence style farming. I have nothing against Alice Waters personally and admire her ideals. The problem I have with her is her professional conduct– i.e. not giving enough credit to those who cooked their hearts out at Chez Panisse over the years. It’s Alice’s show & she’s the star. Amen! Are you sure you wouldn’t prefer Denebian slime devil or something to overbearing, tin-plated dictator with delusions of godhood? It’s funny that you post this, I just finished reading Waters’ lastest book as well. It was DEFINITELY something I needed. At this point in my life, I can cook the complicated, but I have no idea what to build off of. I have no simple recipe storage, so I think the book is fabulous. Especially since these days I am more than short on time. Personally, I think that Kingsolver comes off as far more elitist and preachy than Waters. You always manage to articulate so well exactly how I feel about an issue and more. Thank you. How she delivers her message is a huge part of the problem. I recently saw her on the Sundance’s Channels’ Iconoclasts series and she drove both my wife and I batty with her preachy, heavy handed messaage. And Chez Panaisse seems way over priced and full of hype if you aske me. It’s a long way from a typical, affordable, neighborhood French bistro. Alice Waters and I are about the same age. When I was in my early 20s, I was working away at a crappy entry-level job — and being blessed enough to be learning about the wonders of local, fresh, creative foods by eating at Chez Panisse prix fixe restaurant. About once a month, my friends and I would scrape together our pennies and indulge. I ate things I never would have believed I’d touch in a million years, but Alice and staff made them delectable. She put out but one menu each night, and you ate what was on it or you went hungry. She truly changed my entire outlook on food, and it has followed me all of my life. I think she deserves all of her success — and, so what if she’s a bit eccentric in her demeanor. Get over it, Salon! Barbara — thanks for standing up!! I’m disturbed that so much of these conversations around Waters’ comments – as well as her comments themselves – are so data-free. Is there an urban poor neighborhood anywhere near you? Go there. Look at what’s in the local markets – supermarkets if the neighborhood is lucky, streetfront markets if they’re not. Check the prices. Check to see how long the farmers’ markets in that city stay open in the winter. Look at how far off the bus and transit routes any of those sources may be, remembering that someone who is urban-poor may not have a car; or the car may be being used by someone else in the household doing a second or shift-work job. Consider how hard it’s going to be to get fresh groceries back to a household if they have to be carried on the bus. Then try calling these people “lazy,” as an appallingly uninformed poster did above. And if you do any of these things and you’re surprised at what you see, consider using that energy to advocate for better fresh-food availability in urban poor neighborhoods. It’s a tough struggle, people have been fighting it in some cities for a long time, and it gets a lot less ink than it should. I didn’t realise you’d been writing on this subject. It has been on my mind too and I wrote a post yesterday unaware of the furore over here. (Mine is very short. tongue in cheek and not in depth) Last week I would probably have agreed with your article. But since seeing Alice speak for the first time on Tuesday however, I am not so sure. I try hard to make good choices at food but when Alice tells us she gets her take out and does her shopping at “Chez Panisse”, really how can any of us relate to that when she’s the only person in the world permitted to do her ‘food shopping’ there. My opinion of Alice Waters has declined over the past few years. She has done incredible things in terms of how we look at food in this country and I greatly admire her for that, but sometimes she is just too uncompromising. I once read an interview where she was asked what people in northern Minnesota should do about eating locally during the winter. Her response was that they could still grow lettuces in hoop houses. I live in interior Alaska. Growing lettuce in a hoop house outside my cabin when it is -40F outside is not a practical thing to be doing. I thought that comment made Alice seem clueless about how the real world works and my admiration dropped a few pegs. We do have a wonderful Farmer’s Market that is open about 4 months a year. I do as much of my shopping as possible there. But during the rest of year, I have to rely on the grocery store for my produce. Going to the store has nothing to do with my laziness, it is just the only choice I have. Sustainability is an interesting and complex subject. Just how does Alice define sustainable? Alice should seriously question Ameya Preserve as “an 11,000-acre plot of sustainable land.” In fact, that is quite a joke. Paradise Valley, south of Livingston,MT, is a semi-arid environment. Agriculture requires a lots of water, which is a limiting resource in that part of the world. Ameya Preserve advertises 20 acres of ponds and lakes, none of which exist currently. Those ponds will be filled mostly with ground water and surface runoff, while creating a huge evaporative surface. That is a waste of precious water. Secondly, there is nothing sustainable about building a luxury development in important wildlife habitat that currently is undeveloped. Have any of you readers looked at the Ameya Preserve website? How sustainable is the house that’s pictured on their website? Where did the copper flashing on the roof come from? Look at that weed/pest-free fertilized bluegrass lawn. How much water does that require? For Ameya Preserve, “sustainability” is nothing more than a buzz word that is used to sucker the uninformed. Buyer Beware! Look out, Alice. I don’t know. Even a private school, with its scholarships, would also have a diversity of students with different family incomes. You could make this same argument as to why Waters got involved with Berkeley College at Yale even though most of the students at Yale come from a comfortable middle to upper middle class background. From what I understand, her program has a half a million dollar budget for a single school that is among the most affluent public schools in a city where the median family income is almost ninety thousand dollars. Let’s call a spade a spade. Her program is very expensive and only a affluent school, with fiancial support from wealthy parents, could afford to pay for this program. You’ve got to ask yourself how much more her program could have accomplished for the children in public schools in Berkeley if all those resources hadn’t been focused on a single school. I’ve seen pictures of the project, and its incredibly chi chi and precious- wrougt iron gates, custom made aprons with ‘The Edible Schoolyard’ embroided on them, hagiographic posters about the philosophy of Alice Waters outside the classrom, etc.. I too picked up a ‘let them eat cake’ attitude from Alice Waters as well. And, its not cause I think she’s arguing that only the rich should eat well, but that Waters comes across as ridiculously naive and ignorant as the reality on the streets as Marie Antoinette was. When the French were rioting because they didn’t have enough bread to feed their families, Antoinette was so protected by her bubble of privilege that she couldn’t comprehend why people didn’t eat cake, which was even more out of the reach for the population, if they couldn’t eat bread. Alice Waters enjoys this same priveldge with her celebrity chef status and has spent too much time in the echoing chamber of Berkely where she is as far removed from how people live in America as Marie Antoinette was in her day. There’s another interview with her at SF Chronicle, and her response to those in the MidWest who don’t want to just eat root vegetables in the winter is to build their own green houses to grow vegetables. It never crosses her mind that something like that would be financially unfeasible for many people just like it never crosses her mind that her ideal is too costly in time and money for many families in America. It doesn’t help matters that in her audio interview at Salon, she mocks such concerns by repeating them in a falsetto voice. There wasn’t a $500K donation to the Slow Food Movement, only a 100K donation. The rest of the money was given to Alice Waters. Just remember, when Alice Waters sells out, she doesn’t sell herself that cheaply. 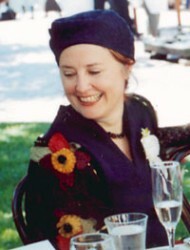 Dana–do you have a citation for your assertion that Alice Waters pocketed most of the donation to Slow Food? Or is it just slander? If you have citation or other proof, please let me know, and I will publicize it. Otherwise, I will assume that you are using my blog to slander someone–and I will therefore, have to moderate your comments. I just came across your site and I have to tell you, I have been here a couple of hours now! Love it!! I totally agree with all that you wrote in this post! The above statement being so incredibly true!! I have a very hard time believing that there are areas that do NOT have local markets! Phooey! I have lived in many areas between NJ and NYS and I have not once had all that much of a hard time finding a local market. It’s a shame how many people are so mis-informed. Eating local and or organic is rarely so much more expensive. Well, I’m off to read more of your incredible writtings and recipes. Thanks!! I haven’t checked in on this blog since my last comment, so I’m a little surprised that my comments about Ms. Waters are regarded as slander and therefore any comments that dares to question St. Alice will be moderated. Its your blog, and obviously, your decision whether or not to strike or edit any comments that you deem critical of Ms. Waters. But, I think its fair to point out the terms of the deal, especially in light of all the grief she’s given Rick Bayless for his involvement with Burger King years ago. Right now, food prices are skyrocketing and becoming a major concern for millions across the world. Left unsaid in Water’s vision is that in her boutique world with its boutique prices, there wouldn’t be enough food for those people. And, if you want to delete this statement, then so be it. And, I just have to add, that it just seems so distasteful for the Michael Pollans and Alice Waters in this world to celebrate these skyrocketing food prices when so many people are struggling financially right now. (NYTimes, April 2, 2008) Its stuff like that why people dislike Alice Waters so much, as she waves her finger at people in a disapproving manner about what they should or should not do.